Your home windows are a key layer of protection for your family, but they are also easily compromised. Fortunately, by being aware of these risks, you can keep your windows strong and your family comfortable. Even the best windows are subject to the following threats, so be sure to inspect for them regularly. Poor Installation: Sometimes window installers do a poor job. This isn’t your fault, but it can impact the energy efficiency and comfort of your home. The best way to pinpoint a faulty installation job is to contact a window professional for an inspection. Severe Weather: Wind, snow, and ice can all damage your residential windows. While you can do little to prevent natural events, you can protect your home by installing strong windows and addressing any damage quickly. Water Leaks: Water damage can cause a host of issues, including mold, mildew, and rot. If your windows are showing signs of sagging, rot, and general weakness, water could be to blame. Keep your gutters and roof in good condition to prevent this damage in general. 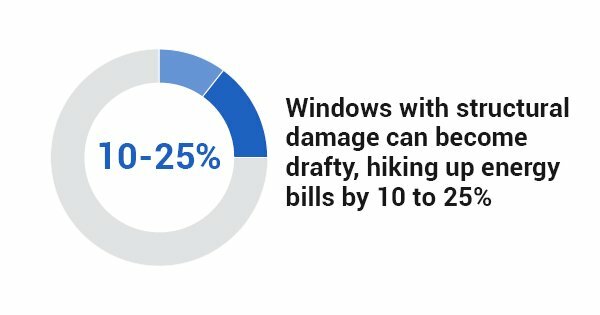 Structural Damage: Windows with structural damage can become drafty, hiking up energy bills by 10 to 25%. By installing strong glass and tightly sealed frames, even the fastest flying objects may not penetrate the glass. However, damage also occurs because of age, so order replacement windows when necessary. Household Pests: Bugs and small animals can cause window damage as well. Keep an eye out for termite damage and address any bees nests as soon as possible. Keeping your windows clear of pests will prevent them from later sneaking into your home. Remember: The best way to assess your home windows is to hire a professional. A window company employee can analyze your windows as well as the conditions around your house, making recommendations for the type of windows you should have installed. By taking the time to invest in your windows, you can keep your home sealed and your family comfortable for years to come. Best Windows Inc. is Chicago’s expert source for window replacement. Contact us today to schedule your commercial or residential window installation.